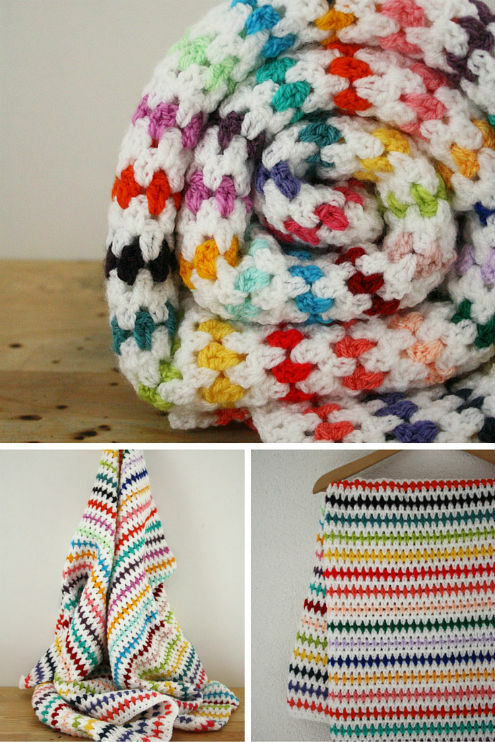 Are you thinking of making your very own crochet temperature blanket? 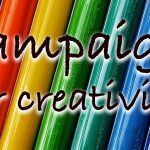 Have you heard of the idea, but are unsure what it is? Are you looking for temperature blanket color charts, or ideas for temperature blanket patterns? Then welcome to my complete guide to Crochet Temperature Blankets. You could be entirely forgiven for assuming that a temperature blanket is in some way heated. Like an electric blanket you can crochet. But it is simply a way of randomly selecting color variations, whilst working on a continuous annual project. A Temperature Blanket is a crochet or knitted blanket that is made a row at a time. You make one row every day, for a year. The temperature part is what makes it truly unique. Each day have a look at the temperature where you are, and using a chart this will help you to decide which color to crochet with that day. To keep things consistent, choose how or when you will find the temperature. Your main choices are to pick the highest temperature that day, lowest that day, or the temperature at a particular time of day. You can choose which colors indicate certain temperatures yourself, but you might also like to work from a temperature blanket color chart. I have put a couple together here. 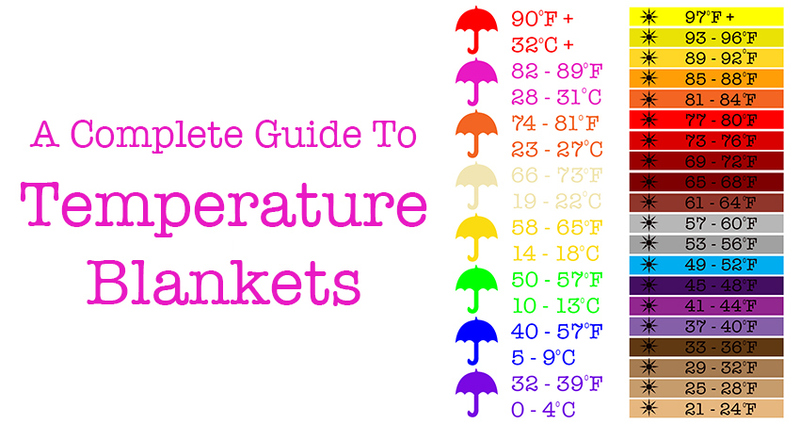 One simple temperature blanket chart with eight different colors, and another more complex choice. My simple temperature blanket color chart will help you to crochet your temperature afghan in just a few select colors. 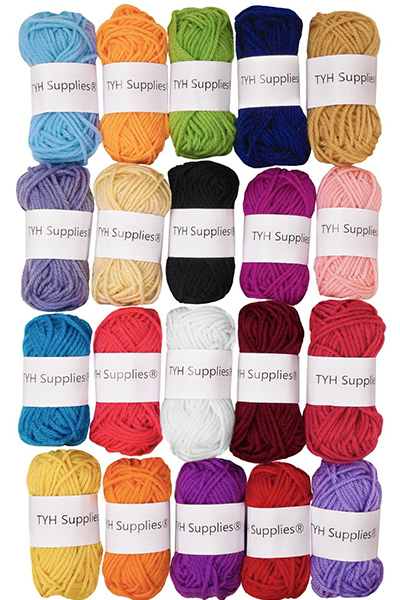 Although you will need more yarn stocked and ready, I think a more detailed and complex color chart will give you the most stunning finish to your crochet temperature blanket. I have created this chart based on the beautiful spectrum of colors that steel passes through as it is heated. Before you begin, lay out the yarns you have chosen and make sure that you are happy that you will remember the colors each represent. Cutting off a swatch and taping it to the relevant line of color on a printout can be a helpful way of staying on track. Whilst it is nice and easy to use a temperature blanket color chart, you might like to make use of yarns you already own. You can try and find color combinations that work for you by cutting some short scraps from each color, and arranging them on a piece of paper. When you have shuffled them around into an order you are happy with, sellotape them down. You can then write your temperatures down the side, and keep this as a handy key. Another fun way to choose your colors is to pick up a color chart at your local DIY store, and write the temperatures on yourself. This can allow you to make a temperature blanket that varies within a range that is desirable to you. Temperature blanket crochet can incorporate a huge variety of styles and crochet techniques. You can choose the type of temperature blanket that you want to make. Either building a traditional granny stripe or square crochet temperature afghan, or build one using a variety of different crocheted rows. Your temperature afghan will be a totally unique labour of love. Something that is unlike anyone else’s and reflects a part of your own life. If you want to check out other people’s temperature blanket patterns for inspiration, I have collected my favourites here for you. You can make your own crochet temperature blanket, using a standard blanket pattern and simply color changing with each row, or couple of rows, that you produce daily. Here are some lovely patterns that I think would convert to a temperature afghan really well. 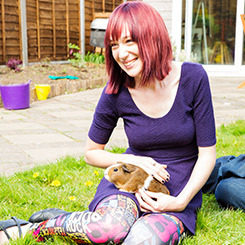 Photo used with kind permission from Happy In Red. I love this Diamond Stitch Blanket Pattern. It’s nice and simple, but produces a very high quality, great looking blanket. When using it as a temperature blanket, I recommend that you do two rows per day. Keeping the alternate white rows and reflecting the temperature with the other colored rows. As it’s an annual project, I recommend extending the row width and working towards a lovely giant double bed sized crochet temperature blanket. 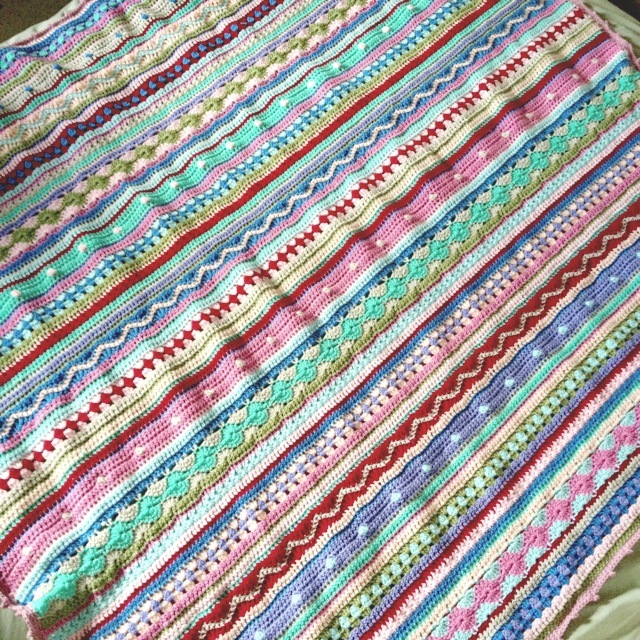 You can find the full pattern for this gorgeous blanket at the Happy In Red blog here. Photo used with kind permission from Not Your Average Crochet. I have been looking for an excuse to give the As-We-Go Stripey blanket a try for a while now. It’s a brilliantly varied design, packed with fun different crochet techniques. Your crochet temperature blanket using this design can be crocheted a single row per day. The only deviation you need to make from Hannah’s gorgeous pattern is to color change to the relevant temperature color. You can find the full pattern for the As-We-Go Stripey Blanket by Not Your Average Crochet here. You might also like to have a go with my Easy Crochet Baby Blanket pattern. 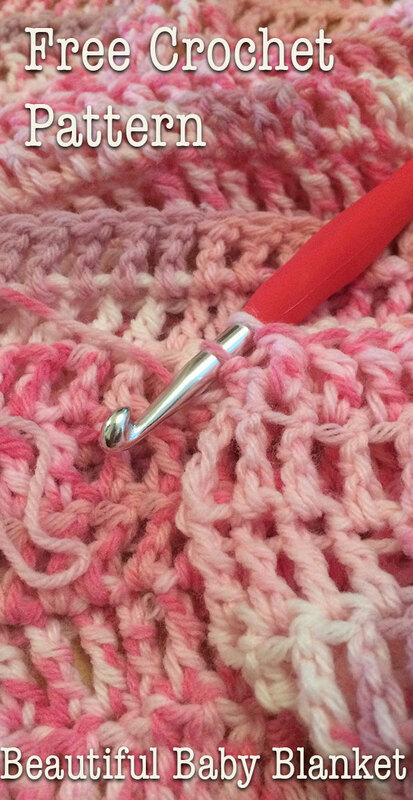 It is ideal for beginners to crochet, and very quick to put together. All you need to crochet a temperature blanket is a pattern, a range of yarns and a color chart. It’s a project which can be as simple or as complicated as you like, and will produce an amazing unique crochet afghan for you to treasure. A small amount of work every day for a year, and you will have a wonderful work of art to keep. If you think you are not going to crochet for a day, just take the temperature and write it down so when you pick up your project, you have that information handy. How many stitches do you need to make a row for the temperature blanket please? Hi Carolyn, It depends which pattern you decide to use and what size of blanket you’d like to make I’m afraid. Are you using one of the patterns linked in the article?